Hello Tim, Thank you for applying for my Award! I have reviewed your site, and wish to congratulate you for the superb job you've done! You have a beautifully presented site with excellent navigation and content. I was very impressed with your work! 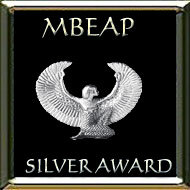 It is my pleasure to award you with MBEAP International Silver Award, Congratulations!! Congratulations your excellent website has earned Sgt Pleiku's Number 1 Website Award. This Award given only to those websites that show graphic and design excellence.